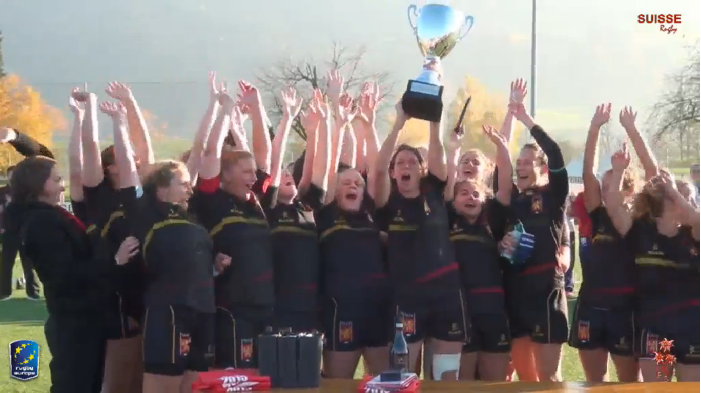 One of the world’s oldest women’s rugby nations lifted their first senior title this weekend when Belgium beat Switzerland to win the European Championship. It was a well-deserved victory for the Belgians, who had started as favourites and were clearly a level above their opponents in this year’s tournament. Overall, Belgium were faster, more experienced and in terms of technique the better team in the final against the well-supported Switzerland team. On a truly glorious autumn day, with barely a cloud in the sky, the Belgians proved to be quicker to the breakdown, faster at moving the ball through their hands, and more aware of gaps and opportunities. The opening 20-30 minutes was a tale of them absorbing the Swiss attacks, overturning possession or otherwise seizing on errors, and then breaking away and scoring as they raced into a 22-3 lead. But this was not to be an entirely one-sided game. While Belgium had the advantage of speed, Switzerland were a significantly stronger and more powerful team, especially up front, and after the first half-hour this began to have an effect. The Swiss team began to reduce errors, keeping the ball with their powerful tight five, and were unlucky not to score their first try from the final play of the first half. ​After the break, the Swiss continued where they had left off and pulled a try back with a well worked maul. It was a tactic that they continued to use, and with around 10 minutes left the nineteen-point halftime gap had been reduced to just nine, with Belgians hanging on at 29-20 (a scoreline that would have been even closer if the Swiss had possessed a good goal kicker). Unfortunately for the enthusiastic crowd, standing up to four deep on the near touchline, it could not last. The Belgians regrouped and used Switzerland’s tactics against them, with the home having no answer to a maul which drove over to re-establish a three-score cushion. Greater speed and awareness a few minutes later further extended the lead, when a Belgian player was quicker to react to a loose bouncing ball to set up another try, and then again experience and awareness allowed Belgium to score one more try from the final play with a great interception resulting in their fourth try of the half and a deserved 50-20 victory. Earlier in the day Russia defeated the Czech Republic 41-15 to take third place. We hope to be able to add a report on that game and team details for both games later.